[New for 2017] Ready for another Talenti flavor? So far it looks like there are just four truly new flavors for 2017 and I've already dug in to the intriguing peanut butter fudge sorbetto. Wow, it's weird going from oat of this swirled to this in the same day. The flavoring seems like more of a generic berry instead of being specifically blueberry. I don't mean that in a bad way. It's just my brain thinks this is some kind of sweet black raspberry flavor with tiny oat clusters mixed in. Speaking of that, the berry flavor does take precedent to the oats. This reminds me of some kind of funky froyo flavor with the bits mixed in. That said, I do get that blueberry crumble vibe they were going for, more or less anyway. The thing is that they call this vanilla blueberry crumble and I don't know why they went for the vanilla factor. 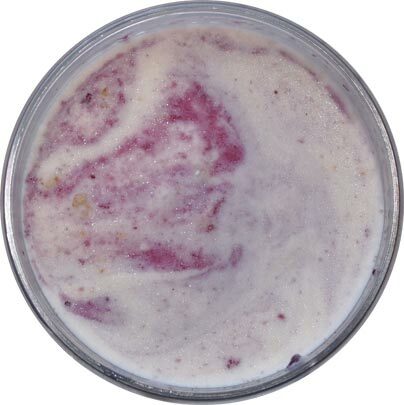 I get doing a blend of vanilla and blueberry to give it a more well rounded flavor, but as I went down, the blueberry faded away and the oats just aren't enough of a factor to compensate. 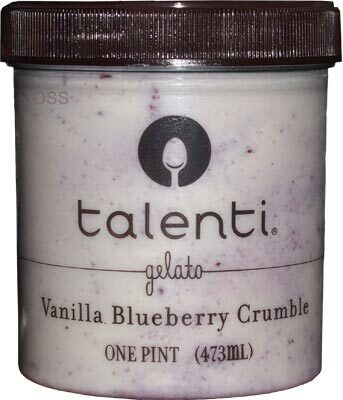 This feels like Talenti of old and talenti of new at the same time. We've got a neat flavor that pairs well with the talenti gelato texture, but at the same time we are running into the newer issue where there just isn't enough swirl and mix-ins like there used to be. This one is definitely worth a pick up so far, but let's see how it holds up. On Second Scoop: Worth a pick up might sound a little too endorsing (yes I know that's not the proper use of that word). This isn't bad but it is frustrating that it is so lightly flavored. It's a fine flavor but I guess I just don't understand it's place in life. Was blueberry crumble too whatever so they made it the more boring vanilla blueberry crumble? Again, it's not bad but as the swirl died down, so did my enthusiasm. How about this, wait for it to go on sale, then give it a try. Definitely don't plop down the full $5.99 if you are hesitant about picking it up. Maybe I'm just boring when it comes to ice cream but I just can't see the appeal of flavors like this. If so much rather have a scoop of ice cream on top of hot blueberry pie or crisp. So for people who like this stuff, I'm curious... Is it actually preferable to flavors like chocolate chip. Mint chocolate chip. Cookie dough, etc. , Or easier than making pie, or is it more the novelty factor? 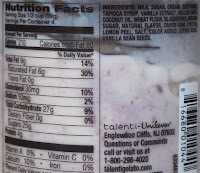 Love Talenti and can't wait to try some of the new flavors...but I can't believe how much sugar their flavors contain! It's interesting that you say this, because I finally found Peach Butter Biscuit and it left me feeling the same way. I loved the peaches, but they were only on the bottom, the biscuit pieces tasted hard and floury, and the base didn't taste like anything. I finished it feeling very confused. Looks like you might have gotten more swirl then I did. Mine had blueberry all over the sides of the container, looked very promising. Once opened, nothing, no swirl in the middle at all. They should rename it to 'Vanilla Crumble Gelato'. @Anon: Yeah, that happens alot. Don't forget that I often take the scooped pint shot near the top, and then rely on my words to describe if the swirl stays the same or diminishes. In this case, it did fade like it does in too many other Talenti pints. 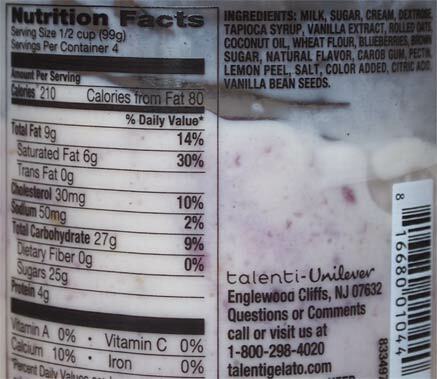 The reality is that tiny startup Talenti was more heavy handed than the widely distributed version run by Unilever. They've long since left their old factory and moved to Georgia. This flavor is decent. Pleasant to eat, but could be better. Haagen Dazs did a MUCH better job with their Blueberry Crumble flavor (why they get rid of their best flavors, I'll never know). 1) It doesn't have eggs, and you can taste that. It's not rich enough for me. 2) It needs more blueberry. 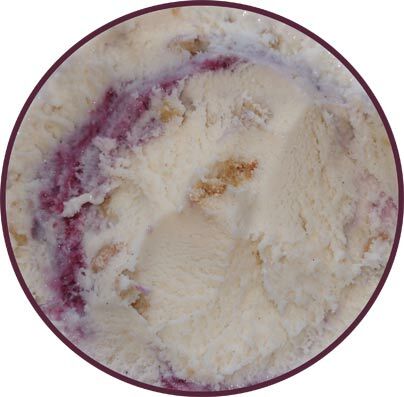 The pint I got had blueberry on the bottom, so it was really a "Vaguely Blueberry-flavored Vanilla Crumble" gelato. I'd amp it up by making a blueberry sauce and pouring it on top, but then what's the point of buying the flavor?